Denton’s ability to sum up Tetsuo’s hell so succinctly is probably second nature at this point. Teaching English in what he calls a “neglected borough of London,” he became well acquainted with the everyday apocalyptic of the teenage mind, reading essays featuring “stabbings, murders, suicides, love, zombies, global disasters … tropes of the adolescent.” It makes sense then that the character tasked with navigating the dystopia of Denton’s debut novel – The Earlie King & the Kid in Yellow, published by Granta in January – is himself a teen, one unsure of his exact age and on a quest that will eventually put him on course to dismantle the only societal order he has ever known. We know next to nothing about Denton’s protagonist, “a hard fist of bright yellow” in his yellow rainproof skins, who knows little about himself other than that his life is in danger, his girlfriend is dead and his daughter is in the care of the people who want to kill him. The kid in yellow’s Dublin is “a sob of depthless confusion,” ruled by the Earlie King and his Earlie Boys, drowning under decades of rain and layers of institutional corruption. He lives in flats converted from Europe’s largest amateur sporting stadium and dreams of sunlight. The death of his girlfriend, only known as T, in childbirth after she had carried the “babba” for twelve months, leaves the kid scrambling to fulfil a promise made to T. He had sworn to take the child away from Dublin, away from the floods, away from the powers that be. The main hitch in his plan is that the powers that be – namely the King – has the kid’s daughter and had promised T, his own daughter, that the kid would only survive if he never claimed his babba. The kid’s task is an unenviable and frankly stupid one; that a singular teenager would think it even remotely possible that he could take on Ireland’s ruling cartel and the man famous for barehanded slaughter sitting atop it is reckless at best. Yet, it had to be a teenager, as Denton put it, “only a teenager would possess enough love, hope, hate, fear, outrage, naivety and bravery to take the action required.” The kid is not only left to fight opponents physically stronger and mentally more mature than him, but he is left to challenge and dismantle all that he has ever known: the rule of the Earlie King and Earlie Boys, the crooked slumber of the police force – named the Heavy Gang – and the unending torrents of rain. In America, the students of Stoneman Douglas High School in Parkland, Florida are the ones who are being left to question all that they have ever known. The survivors of the 208th shooting in an American elementary, high school or university since the Columbine shooting in 1999 are not even of an age to remember Dylan Klebold and Eric Harris; to them, having an active shooter on your school campus was a distinct possibility that became a lived reality on February 14. Now, it is the teens that saw their friends, fellow students and school staff gunned down that are taking on gun laws and politicians in a vastly Republican state. Floridian lawmakers are so amenable to the National Rifle Association’s political will that ninety-one per cent of Republican house representatives or senators have an NRA grade of A- or higher. It can seem passé to refer to America as a dystopia, and sure, if you rigidly adhere to the definition of dystopia as “an imagined place or state in which everything is unpleasant or bad, typically a totalitarian or environmentally degraded one” then it isn’t one. But from the glassy distance of Ireland, where gun deaths increased by thirty-one per cent to a total of thirty-eight in 2016, a country where it hasn’t stopped raining for decades seems to me a much more realistic idea than one where a student forced by his father to bring a bulletproof vest to school everyday eventually has cause to use it. There was something of the kid in yellow’s hope, fear, naivety and bravery on display at CNN’s town hall event after Parkland when Cameron Kasky, a junior who survived the shooting, looked Marco Rubio in the eye and said to him, “this is about people who are for making a difference to save us and people who are against it and prefer money. So, Senator Rubio, can you tell me right now that you will not accept a single donation from the NRA in the future?” Rubio, suddenly a shrinking violet, looked as if his suit could engulf him at any moment and blathered his way to a non-answer. Nobody – I would wager not even Kasky – expected anything else from Rubio, but this felt like something of a glass-shattering moment; an emergency casing being broken rather than a glass ceiling, but this was progress. This was the kid in yellow administering a would-be fatal dosage of drugs to the Earlie King, a declaration of war rather than a battle win. Here was a chunk of Floridians, whose state has been controlled by a Republican legislative trifecta since 2011 and has some of the least-restrictive gun laws in the U.S.A, applauding anti-NRA sentiment. This was the first real public sign that change might be conceivable. In her most recent release for Verso Books – Radical Happiness: Moments of Collective Joy, published in November of last year – the socialist feminist Lynne Segal, discussing the building of utopias, writes of “trying to live differently in the here and now, knowing that the future will never be a complete break with the present or the past.” Indeed, the Parkland students are making the case for Americans to live differently, and they will certainly be forced to drag their pasts, their memories of dead friends and any myriad of psychological effects possible after experiencing such trauma into their futures. Whether or not the present energy and anger that such attacks can almost be regarded as normal by now can be carried into the future will define the political legacy of the shooting. 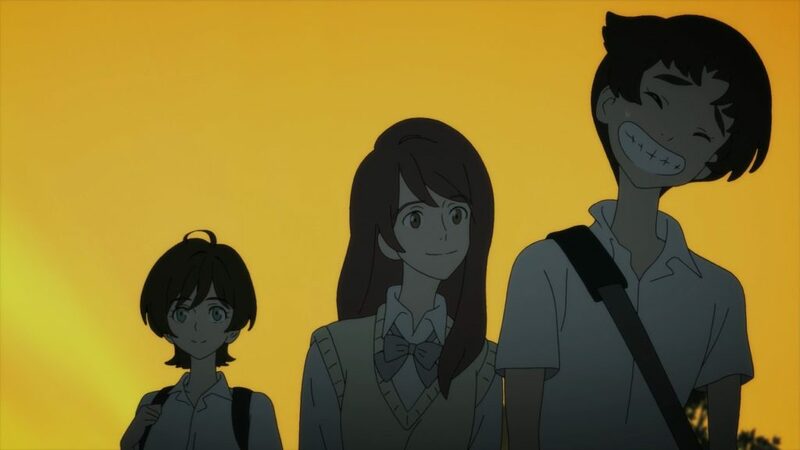 That it took a group of children mourning their friends to push the message of a ban on weapons of mass slaughter like AR-15s and that it is ultimately most likely that they will be ignored calls to mind the plight of Akira Fudo, the teenaged protagonist of Devilman Crybaby, an anime series that was the highlight of Netflix’s January releases. Fudo is left to scream angrily into a void, like Stoneman Douglas senior David Hogg, beseeching people at least twice his age to look at the wreckage they have caused and to halt it before they push humanity over the brink. What sparks the crisis of Devilman Crybaby – the revelation that demons exist and that they have infiltrated human life by hiding their forms in repurposed human bodies – may be supernatural, but the dystopia it creates is all too human. Just like Parkland, people immediately split into camps and began slinging conspiracy theories, the most noticeable being an accusation from the American government that the Russians were behind the demons. Stoked by the fear and paranoia propagated by international governments and mass media, the people of Devilman take to the streets and turn on each other, accusing anyone in sight of being a demon. Riots begin – see Charlottesville for a vision of how easy that can happen in real life – the military is deployed, civilians get their hands on automatic rifles and the bodies pile up in the street. Even the demons, for all their mystic abilities, decide that the most evil action they can take is the decidely human nuking of Paris. Watching all of this, tearing his hair out, eyes full of tears, is Akira Fudo. “I shouldn’t have to! I’m 17,” Hogg told The Outline when discussing his campaigning for stricter gun laws, and it’s the same for Fudo. At seventeen, it is left to him to round up those who share his horror at what is happening and save humanity from itself. Like Hogg’s use of Twitter to spread his message to his (at the time of writing) 427,000 followers, Fudo uses social media to create an international bloc of devilmen. These devilmen, like Akira Fudo, have demons inside of them, but are capable of controlling them because they retained use of their human souls. It is too late, the devilmen are defeated and Fudo dies last, cut directly in half before God cleanses the earth of demons with a shower of meteors. We are left to mourn a child martyr and what might have been had the citizens of Devilman Crybaby’s Earth heeded the pleas of a teenager, knowing that no cleansing act of god is coming for the real Earth. Both Hogg and Fudo prove correct the words of Segal, who said that “social movements arise determined to … overcome the personal isolation and misery neo-liberalism spreads in its wake.” Make no mistake, the angst and mistrust citizens unleash on each other in Devilman Crybaby and in the wake of Florida, evident in adults accusing teenagers of being crisis actors, are products of the segregation and individualization of neo-liberalism. So too are Florida’s lax gun laws, such as the U.S.A.’s first ever Stand Your Ground law, passed in the state in 2005. The social movement, be it the bloc of devilmen or the Never Again MSD organisation founded by Hogg, Kasky and schoolmate Emma González, is where those ignored under neo-liberalism can come together to create one unignorable voice. Even the kid in yellow, on his individualistic quest, would eventually have to rely on help from awakened members of the Heavy Gang, a religious sect and the vigilantes Mister Violence and Saint Vincent Depaul. Even Akira Fudo got to experience what Segal termed the “exhilarating joy of resistance itself,” battling with his old friend Ryo, revealed to be Satan reincarnated. If there is any one real life social movement that has come to represent that exhilarating joy, it is surely that of Jeremy Corbyn, the leader of Britain’s Labour Party. Like the Never Again MSD collective tackled the gun laws that have caused the deaths of so many Americans, Corbyn’s new look Labour party did what no mainstream British party had done since the pre-Tony Blair era and tackled one of Britain’s deadliest killers: austerity. He did so while dealing with the outrage and incredulity of a media class who stand to lose everything should the social order be upset; so much so that a report by the typically neoliberal London School of Economics and Political Science found that he had been “thoroughly delegitimised as a political actor from the moment he became a prominent candidate and even more so after he was elected as party leader.” In the early months of 2018, when kids in yellow and devilmen were being unleashed onto our pages and screens, before Sean Hannity was having on-air aneurysms over the success Alexandria Ocasio-Cortez, a member of the Democratic Socialists of America – another majority youth organisation gaining mainstream attention through challenging the oppressive status quo – it was the Never Again kids that had Fox News and its rabid facsimiles in the conservative media scrambling, to the point that Laura Ingraham was taunting David Hogg for being rejected by four colleges. What Corbyn did for the 66% of 18-19 year olds who voted Labour was something like a real life version of the kid in yellow’s weakening of the Earlie King via drug overdose. Neither won the wars they were fighting in those moments, but they had made the previously unrealistic idea of victory look distinctively possible. For those teenagers, born five or six years after the fall of the Soviet Union, Corybn’s socialism shattered the foundational myth of the world they had known; the era of what the cultural theorist Mark Fisher called capitalist realism – “the widespread sense that not only is capitalism the only viable political and economic system, but also that it is now impossible even to imagine a coherent alternative to it” – was ended, in Britain at least. It is notable that Fisher’s book Capitalist Realism: Is there no alternative? opens with a discussion of the film Children of Men and the dystopia within, one that is “specific to late capitalism” and whose saviour is a pregnant teenager who brings an end to a period of infertility that had blighted humanity for eighteen years. Something similar is happening in America with Never Again MSD; in his interview with The Outline David Hogg spoke of how his generation had “grown up around Columbine … grown up with the recession. We grew up in this police state.” In his lifetime, the recession has been tackled by movements such as Occupy and the police state challenged by the Movement for Black Lives, now he and his schoolmates are taking on the politicians and gun lobby that created the conditions for him to be added to a significant category of Americans: the 150,000+ students who have experienced a school shooting. When the Oxford dictionary announced “youthquake” – “a significant cultural, political, or social change arising from the actions or influence of young people” – as its word of the year for 2017, there was widespread bemusement on social media. The problem wasn’t the word’s definition; it was that few people used it, even if its usage had apparently risen by 401%. Once its meaning had been explained, it was clear that youthquake did in fact apply to the zeitgeist of 2017, which has carried over to 2018 in terms of both the cultural and the political. “In youthquake we finally found some hope in the power to change things,” lexicographer Susie Dent told The Guardian upon the announcement. If utopias offer us “dreams of heaven that could never exist on earth” as Terry Eagleton wrote, perhaps the dystopian youthquakes of The Earlie King & the Kid in Yellow, Devilman Crybaby and Children of Men can offer their real-life counterparts in Labour and Parkland some threads of revolution that they can adapt to their specific needs. Also speaking to The Guardian, in the immediate aftermath of the general election, Adam Klug of Momentum said that “the word ‘apathy’ is thrown at young people when really they feel they are not represented.” We have seen that when given something to fight for, the millennial youth – so often chastised as lazy and spoiled – will prove right the words of Salvador Allende, the martyred Marxist and former President of Chile, who said that “to be young and not a revolutionary is a biological contradiction.” We can all be apathetic – even the kid in yellow was once a runner for the Earlie Boys, indifferent to the injustices of the world – but when given a carrot to chase, we are all capable of passion. Segal tells us that “our political dreams can end in disappointment,” not least in the case of Akira Fudo, but they can “make us feel more alive … when they help to connect us to and express concern for those around us.” The youths of Parkland and the surge of young Corbyn supporters, two of the most notable and most covered recent movements to question the received wisdom and behavioural patterns of the west, have expressed the greatest concern for those that will come after them by trying to stop the seemingly endless cycles of school shootings and crushing austerity respectively. We can all go out like the kid in yellow’s brother – not resisting his decapitation, but crying all the while – or we can look to the love, hope, hate, fear, outrage, naivety and bravery on show in Florida and Britain. We too can dream of – and fight for – sunlight. Odrán Waldron is an Irish freelance writer whose work has appeared in VICE, Deadspin, New Socialist and other publications.